I love horses, though I've hardly ever ridden. So, I'm hoping nearly everyone has some memory, association, fantasy, involving a horse, whether the horse is saddled between their legs, made of pink plastic and purple maned, or trotting around some distant background. Also, frankly, the purpose of these April posts is to help you get writing if you're stuck. 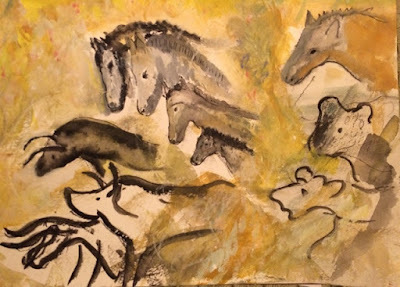 If you have a second day of April poem, please feel free to link it here even if it has remarkably little to do with horses. Whatever! Just run with what you've got. Have fun, and try to make a little time to visit other poets. BTW, the pics are watercolors and ipad illustrations made by me. (I’m not so great at horses but just like them.) Feel free to use, but please credit to Karin Gustafson. Thanks! Karin (unfortunately also known as Outlawyer *this made me laugh*), you can draw magic with an iPad. Wow. 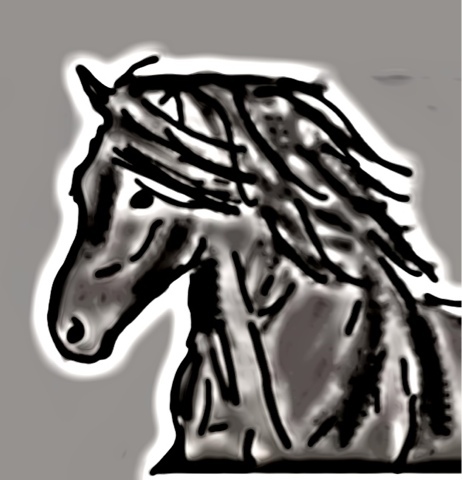 I truly love the horses, especially the ghostly one. Wow! What fabulous drawings. Thanks so much for the prompt! I too like horses, K. I rode my 'Minnie' to high school for my first two years. That was a Nebraska two room country school, there were three of us in my class. Thank you for the nice prompt, it was fun. Your drawings are up to their standard again, you do sooo well. The first is my favorite, to me it has a Van Gogh touch. I don't remember him doing any horses though, so it's the French Provence background, looking out from St. Remy. How strange. I took photos of horses at the beach early on Good Friday morning. Of course I had to feature one with my poem. I created a poem at poetry of the netherworld.blogspot.com using this and the napowrimo prompt. Fortunately I have access to my tablet tonight, but it's still hard to copy URLs. Thanks to everyone who visited me yesterday. I am recovering from a severe depression episode. I will try to visit some of you. 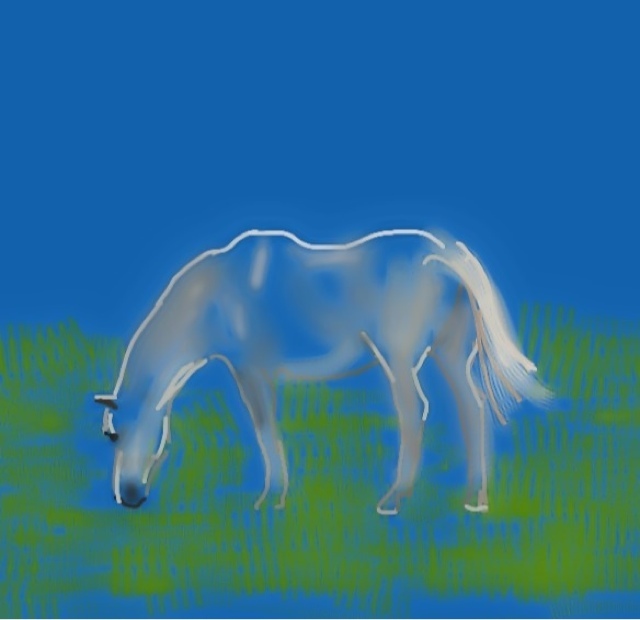 I too fell in love with the invisible horse... Great prompt - and today I needed prompting! Feel free to do the same. k .
I love the unexpected places this prompt took me – and that afterwards I realised you had given me the perfect picture to illustrate my poem, too. Love the artwork, Karin. So sorry to be unable to participate, but best wishes to all who can, especially those who are starting the April journey. Hope you feel better soon, wonderful Hedgewitch. 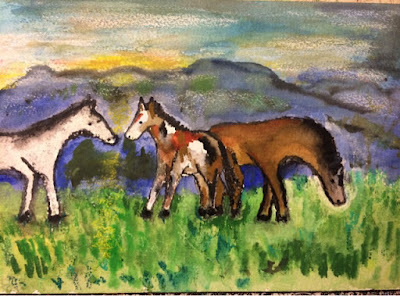 k.
Horses are so evocative for a lot of us -- especially women, I think (?). My poem today combines this prompt and the one over at Poetic Asides, which is a he said/she said conversation. Your paintings are great! I haven't decided if I'm doing the daily challenge yet, but thank you so much for providing prompts every day. What beautiful horses!! Great prompt, Karin. Argh, my tablet will not let me link. My horsey poem is at http://stardreamingwithsherrybluesky.blogspot.ca/a-horse-in-her-back-yard. Sorry, kids. Lots to learn on the tekky learning curve. Sherry, I'll try linking your poem. k .
Ellecee, this link does not allow viewers on without permission. Please would you link again? Thanks, Karin, for the link. Ellecee, I'm have the same issues Kerry is experiencing. I can't get to your blog. Nobody should feel obliged to go to my second. I just have a little more time today than I might in the days coming up so taking advantage of that. Take care! k.
Hope you like my offering K! I turned "horses" into "whore says." I hope that's okay ... creative license, and all.